The walk up to the Boston Massacre began on Long Wharf, October 1, 1768. Four British regiments supported by fourteen ships of the line landed to occupy Boston. Their intent was to end mob rule and permit customs’ officials to collect taxes. An explosion did not happen on the first day of occupation. In fact, the British troops were expected and ignored. In no time, the impact of 2,000 soldiers supported by 1,000 sailors among a Boston population of 15,000, became overwhelming and explosive. By November the head count of the British Army in Boston would reach four-thousand, nearly the equal of the number of adult citizens of Boston. John Rowe was a wealthy merchant. He immigrated to Boston with his brother. It appears they arrived before 1740 and they came with wealth. He was quick to capitalize on his position as a merchant by providing the British Admiralty with space to rent in his warehouse. It became convenient to store and purchase provisions for the Navy. He was active in criticizing the customs’ officials use of their office for personal gain. 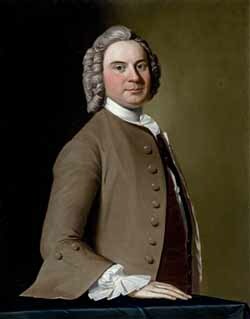 [ii] Yet, he was a loyal Englishman until March 17, 1776, as the British evacuated Boston and ransacked his warehouses. John Rowe maintained his balance through the critical events that lead to the Boston Massacre and the Tea Party by working with everyone regardless of their political disposition. His warehouse at Rowe’s Wharf was rented by the British Admiralty as their administrative headquarters for North America. He housed gunpowder for the British military. He rented two houses to British officers, each for 20 pounds sterling per year. In today’s dollar, this would be $3,589.96, for a year’s rental. It is probable John could not elicit this amount from a local citizen. To his benefit, British officers often came with hard currency. General Thomas Gage and Loyalist, James Oliver, lawyer, treasurer, stamp tax administrator and Thomas Hutchinson Assistant Governor, were often dinner guests. Yet it was well known that John associated with the radical merchants and lawyers, like James Otis, William Molineux, John Adams, John Hancock and Paul Revere. In our blog, we will continue to provide abstracts similar to this on the events leading to the Boston Massacre. If you wish to follow us, please enter your contact information to our mailing list on any page within, http://www.walkbostonhistory.com/. [i] John Rowe’s extensive Diary from 1759-1779, (1763 has yet to be found).